How Much Income Will You Need When You Retire? Earlier we found a way to zero in on what it’s going to cost you to live after you retire. Now let’s figure out what your inflow is going to be once you cross the finish line at work. Retirement income has three components; pensions and social security, passive investment income and active employment. Your goal is to ensure that the first two elements bring in enough money such that working becomes optional. The big mission is to estimate all the income that will be available to you when you retire. Need help planning your retirement? Consider putting me on your team to craft a financial plan and take the guess work out of your financial security. It’s easy to get a sense of pension and Social Security income. Just contact your HR department (past and present employers) and the Social Security website to get the data. If your retirement is more than a few years away you’ll have to inflate your expected Social Security benefits. First get your expected retirement benefits from the SSI site and plug in the appropriate numbers into an online calculator. For example, let’s say you go to the SSI site and determine that your monthly benefit is going to be $1800 a month in today’s dollars but you’ll start receiving those benefits 10 years from now when you retire. Now you need to figure out what your checks are going to look like 10 years in the future. The good news is that benefit will rise with cost of living increases. Sadly, they probably won’t keep up with inflation. That’s OK. No use in looking a gift horse in the mouth. 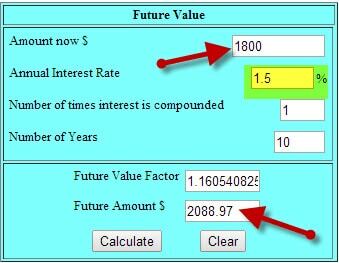 So Jim inputs 1800 in the “Amount Now”, 1.5 in the “Annual Interest Rate” and 10 in the “Number of Years”. The result is 2088.97. That means Jim can expect to receive about $2090 a month when he retires which is $1800 inflated at 1.5% for 10 years. Not hard…..right? You can go through the same exercise to calculate your expected pension income if there is an inflation increase on those benefits as well. There are a number of ways to generate income from investments. The simplest form is interest. You put your money in the bank or buy a bond and the borrower pays you interest. At some level, this is something that many retirees are attracted to. It feels really good because they can collect checks and not worry about it. Well….at least that’s the dream. The reality however is different. While you generally don’t have to worry about receiving your payments with banks at least, the rates are very low and never rise. You’ve already seen what inflation does to your cost of living. If your investment income doesn’t keep pace, you’re going to have a problem. Bonds pay a little more interest but they usually aren’t insured. So on top of receiving low income without any inflation hedge, bonds expose investors to the risk of losing capital. Immediate annuities are another option but usually not a good one. The rates are low, you have some risk (usually low) that the insurance company could fail, you lose access to your capital and your heirs could lose a ton of dough if you die sooner than expected. For our purposes, let’s leave this idea to the side. Real estate is an alternative that may work for you. You collect rent and (hopefully) capture appreciation over the long-haul. On top of that, you might be able to raise the rent with inflation. A nice hedge. Equity investments can also provide great retirement income. They don’t always pay high dividends but you can easily tap into the growth to create income. For example, let’s say you have a mutual fund portfolio and you project it will grow 7% over the next 10 years on average until you retire. Once you retire your plan is to keep the investments in a growth mode (at 7% on average) but you plan to withdraw 4% every year. It’s true that the 7% growth isn’t a sure thing – sometimes you’ll earn more and sometimes you earn less. There will even be times when you’ll lose money in a particular year or group of years. But so what? If you are planning on taking withdrawals over your entire life, who cares if you withdraw more than you earn in any particular year. Over the long run, if you earn 7% and withdraw 4% your account values are going to rise. For these options, you can use the same calculator I referenced above but you do it in a two-step process. 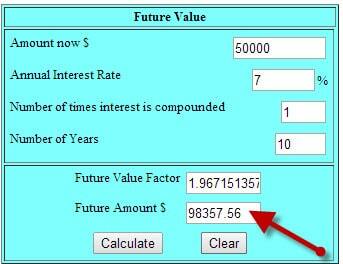 First use the calculator to determine what the value of your capital is going to be when you retire. Then, calculate the interest or revenue. Assume you have $50,000 that you are going to invest for 10 years. You figure you can grow the money (net of tax) at 4% and then withdraw 4% every year for the rest of your life. 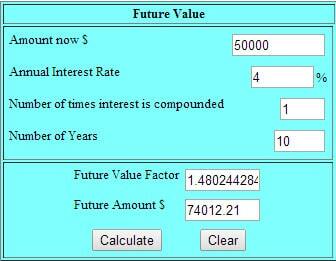 Put $50,000 in “amount now”, 4 in “annual interest rate” and 10 in “number of years”. The result (“Future Amount $”) is $74,000. So in this case, Jim could count on withdrawing 4% of $74,000 or close $3000 a year. That works out to $250 a month. You can use this same process with CDs, bonds, real estate or equity investments. Just for fun, let’s see what that same $50,000 grows to if the investor is indeed able to bump the return up to 7%. As you can see, the result is sweet-a-licious. Rather than having $74k, the investor pulls up into the retirement parking lot with $98k. That’s a 32% increase and that means her income will be 32% higher as well. Yah. Go through this 2-minute drill with each of your investments. First, plug in a current value and reasonable rate of return. Then input the number of years you’ll allow the money to grow and the calculator will provide an estimated future value. All you have to do then is multiply that result by a reasonable withdrawal rate. If you complete the process I referenced above you’ll have a sense of what it will cost to live once you retire. Then, go through this exercise and you’ll know how much income you’ll have too. Pretty sweet. If there is a short-fall, you may have to resort to working during retirement. But don’t put on that fryer apron yet. I’ll discuss a few ways to squeeze a lot more juice out of your existing investments without taking on more risk in an upcoming post.